When a quilter talks about sewing machine needle sizes, they'll say, "It's an 80" or "It's a 12" or "It's an 80/12". That first number is the Number Metric (shown as NM). This system was set up in the 1940's to standardize needle sizes. So where does the '12' of the 80/12 name come from? It is nothing more than the merging of two measuring systems. 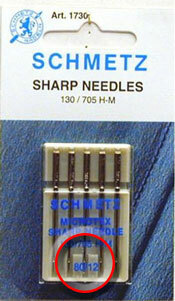 The '12' comes from the corresponding Singer or US needle system. The '80', as we've learned, is the diameter of the shaft in millimeters multiplied by 100. I stood admiring the quilt from afar in a local quilt store. The thread was so sparkly, so bright, so blue. I was mesmerized. And to be honest, I wanted some of that luscious thread for my stash. Imagine my dismay, when I realized that the "sparkly thread" was really sunlight shining through the window behind the quilt and through the gaping holes left behind by a needle that was too big. 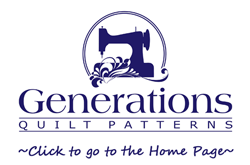 Test your thread and needle choices first before quilting your quilt! Choose the needle size just large enough to get the job done. A needle that's too big leaves unsightly holes—just like that sparkly(not!) quilt I saw. Choose the needle eye based on the type and weight of thread you use. The thread should pass through the needle eye with a minimum amount of friction. Now we'll move onto the Sewing Machine Needle Guide for Quilters which describes the types of needles available for quilting.